Voluminous emissions of carbon dioxide to the atmosphere, rapid global warming, and a decline in biodiversity—the storyline is modern, but the setting is ancient: The end of the Permian Period, some 252 million years ago. For the end-Permian, the result was catastrophic: the greatest loss of plant and animal life in Earth history (1). Understanding the details of how this mass extinction played out is thus crucial to its use as an analog for our future. On page 1130 of this issue, Penn et al. (2) add an intriguing clue: The extinction was most severe at high latitudes. Using a state-of-the-art climate model that was interpreted in terms of physiological stress, the authors further identify the killer as hypoxia, which was brought on by warm temperatures and ocean deoxygenation. a) inducing global warming by burning fossil fuels — leading to lowering of oxygen in the waters. (note: the temperature for THE WHOLE month of January in Australia might have been more than 4 degrees Celsius above average. In the aras of the fish kills, this temperature might have been up to 6 degrees Celsius above average for the WHOLE month. This also increases the change of drought. c) fertilizing the land which creates run-offs into the rivers, leading to toxic algal blooms. The fish have no chance of surviving. We're nuts and the culprits pass the buck between governments and farmers. This problem was known since the 1940s, though the origins were still a bit nebulous. I was involved in exposing this problem and the origins in the early 1980s. nearly 40 yers later, NOTHING HAS BEEN DONE ABOUT IT. Thousands more fish have died along the Darling River in far western NSW, with a drop in temperatures and some rains the likely cause, the state government says. Local Graeme McCrabb on Monday morning posted photos Monday on social media of floating dead fish in the weir pool at Menindee. “It’s starting again,” he wrote on Facebook. The NSW Department of Primary Industries has sent officers to investigate the event, which it believes has affected “large numbers of bony bream and smaller numbers of other species”. “It is likely linked to some rain and cooler temperatures in the Menindee area following an extended period of very hot weather,” a spokeswoman said in a statement to AAP. Cities like Chicago had been preparing for the deep freeze for days, so when it arrived, much of life had come to a standstill. As many as five weather-related deaths were reported as officials across the region urged people to stay inside. Follow updates here. “Of course I care about the fish, but can I be honest, I care more about people.” - Gladys Berejiklian's attitude to the recent fish kills. “People should be very very angry, because this has nothing to do with nature.” - Grazier Rob McBride about the fish kills. A welcome initiative that’s overdue. Regional city centres, such as Penrith that historically haven’t nurtured a network of open public space, could benefit from this. Within the last decade Sydneysiders have witnessed the rapid growth in density within our town centres often minus a commensurate quantity of open space. One of the first things the new minister could do would be to step in and stop Glebe Island from being turned into an industrial wasteland and work with the community to turn this space into much needed open space for all of the surrounding area. Steve Whan says towns on the Murray-Darling should get more water (‘‘Murray-Darling plan has no friends – and that’s a good thing’’, February 4). Given he’s CEO of the National Irrigators’ Council we can be pretty sure he doesn’t want that water coming out of farmers’ allocations. So where would it come from? I think we can guess – Menindee Lakes, other wetlands, and of course South Australia and the poor old Coorong. If the little fishes could evolve two thumbs... Actually it's four — two on each fin. Koalas have two thumbs on each forepaw so they can grip trees and branches better. This article concerns the threat on freshwater ecosystems, which harbor a disproportionate amount of the world's biodiversity. In many parts of the world, freshwater ecosystems are already degraded from a range of human activities, including water extraction, pollution and physical alteration. The data that showed a biodiversity crisis in ecosystems included species loss and breakdown of the ecological processes and resources. Furthermore, several case studies were cited to illustrate the status of freshwater diversity. Numerous reasons for freshwater biodiversity loss were mentioned, which included pollution from pesticides and agricultural and mine run-off, and physical alteration through channelization and impoundments that affected the hydrology and benthic habitat. Despite the successful establishment of institutions to conserve water birds and wetland habitats, there was a lower priority for conservation of freshwater biodiversity in terms of species and habitats. This bias has had important and serious implications for allocation of resources to increase the knowledge and understanding of freshwater ecosystems, as well as for the adequacy of impact assessments for development projects affecting them. This article published in 1999... (20 years ago). According to the Living Planet Index. the popultion freshwater species has declined by an average of 83 per cent since 1970. Residents at Lake Meringo near Moruya on the New South Wales Far South Coast this week have been shocked to find thousands of dead fish and other marine life along the lagoon's shoreline. It is the second major fish kill event in the region in the past five weeks. 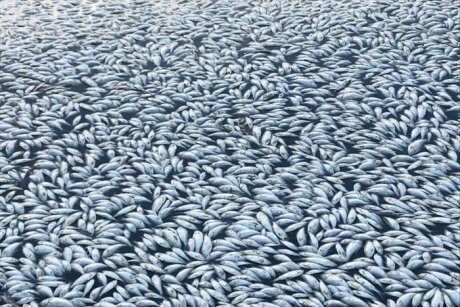 The discovery follows a number of fish kill events around the country in recent months, where millions of fish have died. The NSW Department of Primary Industries (DPI) said it had investigated the matter at Lake Meringo, and the main species affected included black bream, gudgeons, mullet, eels and luderick. The DPI said the suspected cause related to the very low water levels at Lake Meringo and resulting poor water quality. "At these low levels, coastal lakes are very susceptible to high water temperatures, algal growth, and low dissolved oxygen," a DPI spokeswoman said. In 2017, when Barnaby Joyce was the water minister, the Department of Agriculture and Water Resources bought 28 gigalitres of water from Eastern Australia Agriculture, a company once linked to now-Energy Minister Angus Taylor. The deal was part of a series of controversial agreements which saw the Federal Government spend $200 million buying environmental water under the Murray-Darling Basin Plan. The buybacks occurred without an open tender process. Opposition water spokesman Tony Burke has today written to the department asking it to publish, in full, documents relating to the due diligence and value of the deal. Mr Burke is also seeking documents showing the department received advice from the Murray-Darling Basin Authority, State Government and Commonwealth Environmental Water Holder on the deal. The letter follows a statement released by the department at the weekend defending the $80 million water buyback. EAA is controlled by Eastern Australia Irrigation, which is based in the Cayman Islands. Mr Taylor, a co-founder and director of Eastern Australia Irrigation, ended his association with the companies before entering Parliament in 2013. Both he and Mr Joyce deny any involvement, but Mr Burke said the deal raised several questions. "On the face of it, it looks like, for floodwater that only exists in very rare circumstances, that effectively, have paid very top dollar for it," Mr Burke said.